After a long day of berry picking in Allegan County, we headed back to Kalamazoo for dinner. Last time month when my parents were in town, we walked along the Kalamazoo Mall just to show them the area. It was a nice day and we just wanted to go for a walk. As we walked, my aunt noticed a sign for a cheap spaghetti dinner on Monday night. 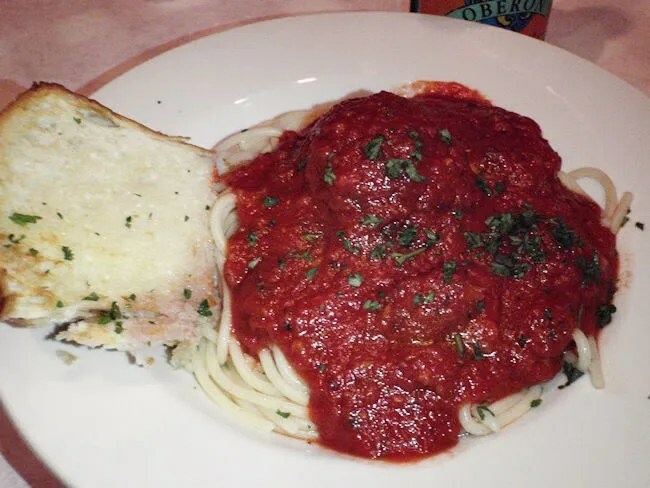 Since they were in town on Monday night, we decided to check out that cheap spaghetti dinner and go to a restaurant that has been on our list for quite some time. 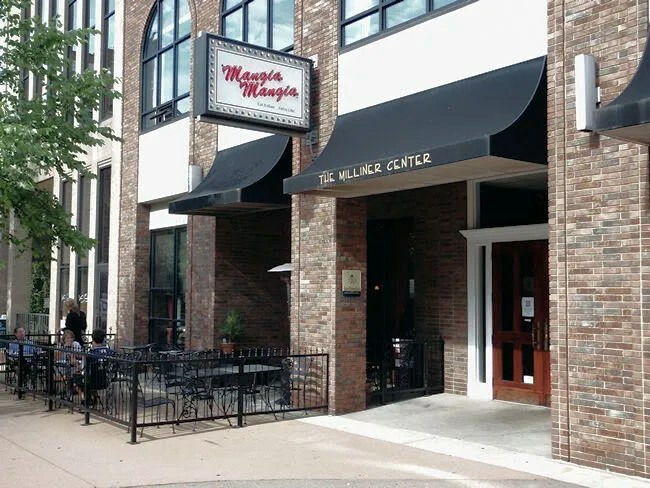 Mangia Mangia is on the Kalamazoo Mall just north of Devisser Alley. The restaurant takes up a ground floor space at the Milliner Center. I was a little hesitant to show up right at 5:00 when they opened, but on Monday nights, that’s not a bad idea. The dining room has a pretty typical Italian restaurant feel. The tables are covered with a red and white checkered table cloth then a piece of butcher paper. The room is kept dimly lit to enhance the mood. A hostess took us to a table big enough for the five of us right in front of the kitchen. We were given menus to look over, but all five of us were going to take advantage of the special. We still checked out the sides and salads as well as the drink menu to see if there was anything else to go along with the spaghetti. There’s a pretty large wine menu both by the glass and by the bottle, but my family doesn’t drink wine. I was the only one that went with an alcoholic drink. I got an Oberon while J and my aunt got Iced Tea, my mom a Diet Coke and my dad, water. As expected, all five of us ordered the spaghetti special. My aunt added on an order of garlic toast to split between the table and J got a side salad. The salad came out first and it was a pretty simple salad of greens with shredded Parmesan and croutons. The dressing she got was the LaCantina. The garlic toast came out with the spaghetti. My aunt cut it into pieces and passed the plate around. It was a pretty simple garlic bread. A long loaf toasted crispy with butter and garlic then topped with mozzarella cheese. It was very tasty and went well the spaghetti. I had no idea what to expect from a $3.50 bowl of spaghetti. I had no clue what the portion size would be or if it would be enough to satisfy me. I felt a little better when I started seeing the tables around me getting served. On a normal night, the spaghetti and meatballs will set you back $12.50. While I’m fairly certain we didn’t get that portion size, we did get a much bigger portion than I expected. The bowl was filled with a perfectly al dente pasta then topped with a sweet meat sauce. J doesn’t usually like meat sauce, but she actually said this one was very tasty. She did pick around the bigger chunks of meat, but didn’t get super picky about making sure they were all out. The meatball that came with each bowl was also a pretty good size. It was a little bigger than a golf ball and incredibly moist. J passed her meatball on to me and my mom gave hers to my dad, so we both had a little extra which was good because we were the two that were pretty hungry. The portion size was just right for the ladies. My dad and I both could have probably eaten another bowl, but we didn’t leave starving. I have absolutely no complaints about the size for the price we paid. Our bill was right around $35. My beer and the two extras added a little more to the price than just the five bowls of $3.50 pasta. Since the spaghetti is the big draw on Monday nights, they have plenty made in advance which made our meal go pretty fast. Definitely a plus for them as they turn tables pretty quickly. 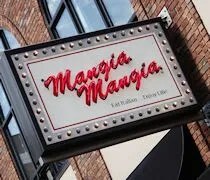 The Monday night special at Mangia Mangia is well worth the trip downtown. The spaghetti got us in the door to check the place and look over the menu. I wouldn’t be surprised if that works on getting a lot of people to make a return visit on a regular night. It just might work with us.